Thousands of educators from around the world traveled to the annual National Science Teachers Association Conference (NSTA) this year to learn the newest instructional techniques and become motivated to evolve their own practice. The conference sought to promote the newly integrated Science-Technology-Engineering-Mathematics (STEM) disciplines and heavily featured the use of high-tech tools to entice and educate students. The exhibitor booths at the conference showcased mini 3D printers, neuroscience experience kits, and a variety of virtual science software — all designed not only to teach science, but to inspire the next generation of learners. It was into this environment that Jeff Turner launched the educational initiative of his company, Jellyfish Art. And during the three days of the conference, I personally witnessed hundreds of educators find wonderment and inspiration though the keeping of marine aquariums. There was something special about the Jellyfish Art booth that seemed to draw people in. Teachers young and old, program administrators, and even other vendors came by repeatedly to learn more about the jellies and all wanted their own tank. I was most impressed by the comment of a grizzled maintenance worker who was driving a forklift before the show Saturday morning. He got off his machine and shared that he’d been working at the conference center for decades, and this was the first booth in years that caught his attention. The Jellyfish Art booth was always busy and a place where teachers informally shared ideas about using aquariums for science instruction. Jeff Turner and the other people at the booth could feel the excitement. “Jellyfish in smaller aquariums are relatively new to most people, and the interest in learning more about our jellyfish was fantastic from teachers at this annual conference,” Turner said. The curiosity felt by everyone who stopped by the Jellyfish Art booth is telling of the power that marine ecosystems have over people. This power needs to be understood, harnessed, and capitalized upon by everyone who seeks to promote the use of aquariums. 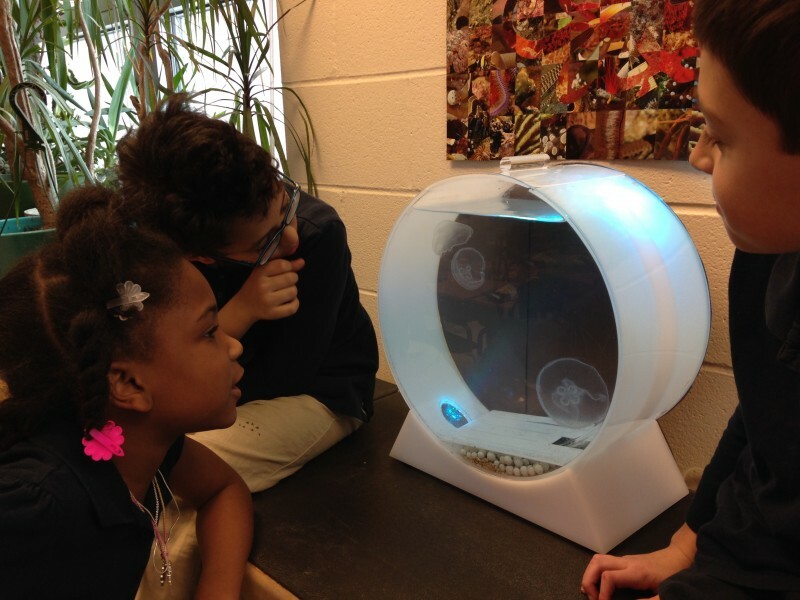 As an educational tool, Jellyfish Art has created a 5 gallon kreisel tank that is powered by a small air pump. It is very easy to use, and the heartiness of jellyfish makes them perfect marine animals to keep in a classroom. Many teachers need to prove the educational merit of anything new before their school will purchase it. Jellyfish Art is collaborating with a number of teachers (myself included) to create an educational initiative to provide lesson plans that meet state and national standards for science instruction. Paola Espitia is their educational director, and is an on call resource for teachers who need technical support or help using the aquariums as teaching tools. Jellyfish Art also provides a 25% educator discount on the tank and subsequent reordering of Jellyfish. Jellyfish Art donated a tank to my schools and it travels around to different classrooms on a regular basis. 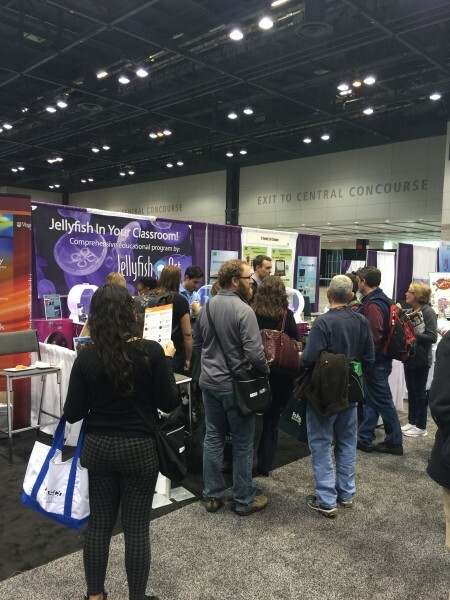 Jellyfish Art plans to attend many more educational conferences in the future and continues to work with educators to expand the resources they can provide to teachers. It is their hope (and mine) that their venture can pave the way for the widespread use of marine aquariums in the classroom. When I Say "Aiptasia," You Say "Pest." Brandon Rutherford is National Board Certified Teacher at Stratton Elementary School in Champaign Illinois. He is interested STEM instruction and the influence of progressive, project based education on the social, emotional and academic wellbeing of children. In 2013 he created a coral reef ecosystem project that uses aquariums as platforms for learning. To date his project has built over 1,000 gallons of marine and freshwater aquarium space around his school that is maintained primarily by students. Brandon continues to work with the marine aquarium community to promote aquarium keeping and science education in schools. All the attention that the Jellyfish tank got is very telling of its educational aspects over software and technology developments. With schools so focused on keeping up with technological advancements these days, there is less emphasis put on what really motivates students. Not only students will be interested in this, but adults too as seen at this conference. Jellyfish art seems committed toward helping teachers start their own tanks in the classroom which I think schools should take advantage of. As you mentioned in another article, the lifespan of a jellyfish is less than a year so it is a very non committal way towards schools using marine systems in the classroom.